After I arrived in Puglia for Radici del Sud, I spent two nights traveling around the region and even stayed in a trullo, one of the cconical stone structures so typical of the region. Then we returned to our original hotel outside of Bari where we were reunited with the wine buyer members of our group for another tasting called “Discover Ciro Wines from Calabria” where 4 producers show one wine each. All are imported into the USA. 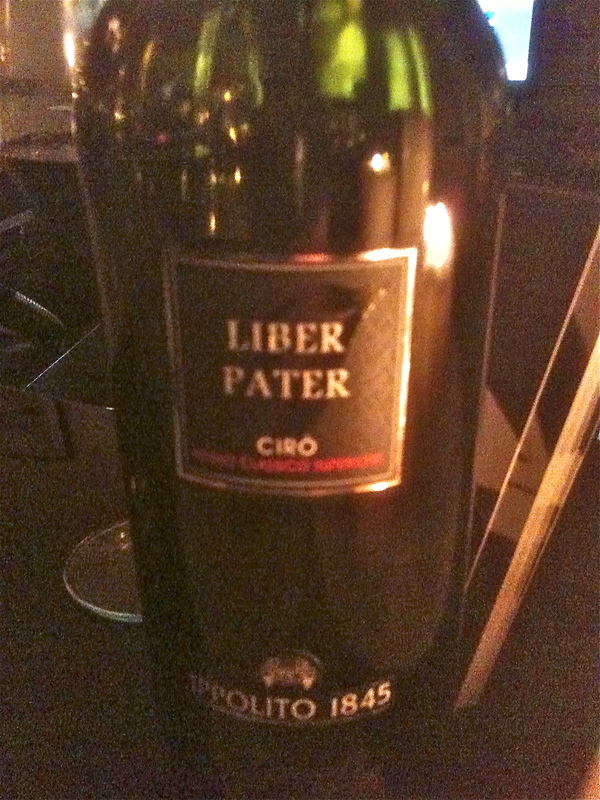 Ole Udsen, “Mr Puglia,” did the translation and added his comments on Ciro wines in general. Cirò Rosso 2013 Classico Superiore ‘‘A Vita” made from 100% Gaglioppo from vines up to 45 years old. Grapes are destemmed and fermented in stainless steel using only ambient yeast and the wine is aged in stainless steel tanks. The winery is certified organic. The wine has hints of cherry, faded roses and tobacco with a very nice finish and aftertaste. Cirò Rosso 2013 Classico Superiore Cataldo Calabretta 100 % Gaglioppo. The vines are bush trained and are 15 years old. The soil is clay and limestone and there are 5,000 plants per hectare. The harvest is by hand the third week of October. Fermentation is spontaneous with native yeasts and there is a two-week maceration without temperature control. The wine is aged for 10 months in glazed cement tanks. It remains in the bottle for 7 months before release. The estate is certified organic. Ciro Rosso 2012 Classico Superiore Scala, 100 % Gaglioppo. Soil is clay and sand and the exposure is south/southeast and the 10 year old vines are espalier trained. The grapes are destemmed and maceration takes place at 77°F until the fermentation is completed. After soft pressing, the wine is then racked and left in cement tanks for a minimum of 10 to 12 months. This is a robust wine with good red fruit and hints of sour cherry. Ciro Rosso Classico Superiore 2012 Cote di Franze made from 100% Gaglioppo. The vineyard is at 250 meters, soil is clay and sandy, alberello (bush) trained. The vines were planted in 1977/1958/1980. There are 9,000 plants per hectare. The hand harvest takes place in October. Fermentation is spontaneous, maceration is in stainless steel and the wine is aged in stainless steel for 12/24 months depending on the vintage. At the hotel there was a blind tasting over four sessions for the wine competition and the top wines were announced. We were divided into four groups: two groups of buyers and two groups of press. My group tasted over 200 hundred wines over two days in the four sessions. The wines were rated on a 100-point system. The top rated wines were announced on the last night of the event. Two wines from Di Meo, one of my favorite producers, were picked as # 1 in their categories by the journalists: Greco di Tufo 2015 and the Fiano Di Avellino 2015. It is interesting to note that the journalists and buyers only agreed on 3 wines but if it was #1 for the journalists, it was #2 for the buyers and visa versa. See the complete list of winning wines at the end of the blog. Puglia IGP Fiano Minutolo Colli della Murgia. 100% Fiano Minutolo. The origin of this grape variety is not known. It does not have any relation to Fiano di Avellino or the Fiano grown in Puglia but the IGP has to have Fiano Minutolo on the label, it cannot just say Minutolo. The wine was dry with good citrus aromas and flavors. Every year the Italian Trade Commission sponsors Italian Wine Week in New York City at the Midtown Hilton Hotel. For this year’s Vino 2016, the spotlight was on the regions of Calabria, Campania, Puglia and Sicily. The panel members were: Gianfranco Sorrentino, owner of restaurants Il Gattopardo, The Leopard at des Artistes, and Mozzarella and Vino, all in NYC; Gary Grunner, Co-Author of Italian Wine Notes and Italian Wine and Cheese Made Simple and 2009 Silver Award recipient of The Italian Trade Commission’s distinguished service award for the work he has done promoting, educating, representing some of Italy’s top producers and for building Italian wines in the USA; and Marco Melzi, a journalist, educator, and communication consultant. The panel discussed each wine in detail and Southern Italian Wine in general and concluded that extraordinary values are to be found in Southern Italian wines and that they enjoy drinking them the most. Some of the finest are from the regions of Calabria, Campania, Sicily and Puglia. Unique varieties, both red and white, are made into wines that reflect the terroir by a variety of expert producers using both traditional and innovative technology. Listed below are the 12 wines picked by the panel as examples of the extraordinary wine values from Southern Italy. All of them go very well with food, especially the food of the region where they are produced. They are listed with the grapes they are made from and the distributor/importer. Ciro Rosso Classico 2012 DOC 100% Gaglioppo Tenuta Baroni Capoano Calabria $16 Wine Emporium. My motto has always been that you don’t have to spend a lot of money on wine to drink well. 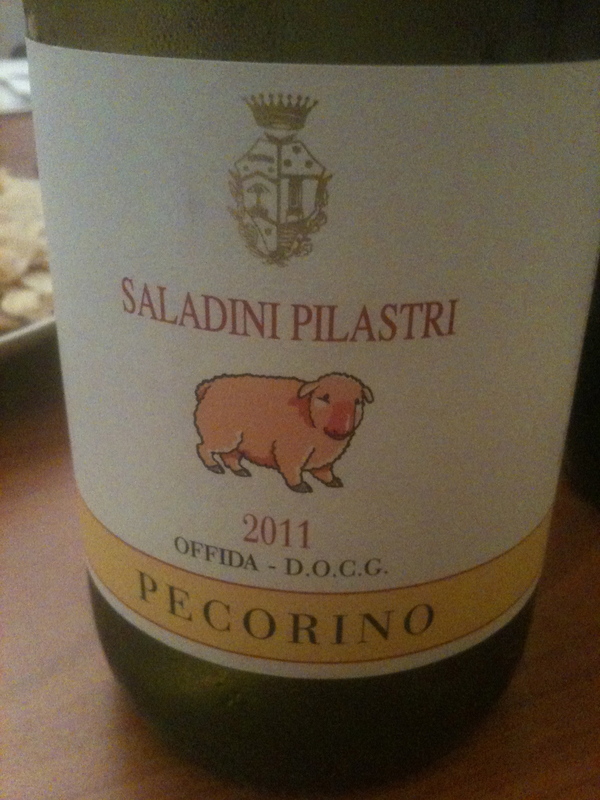 Over the last year I have tasted many excellant Italian white wines that are under $20. Here is a list of some of my favorites. 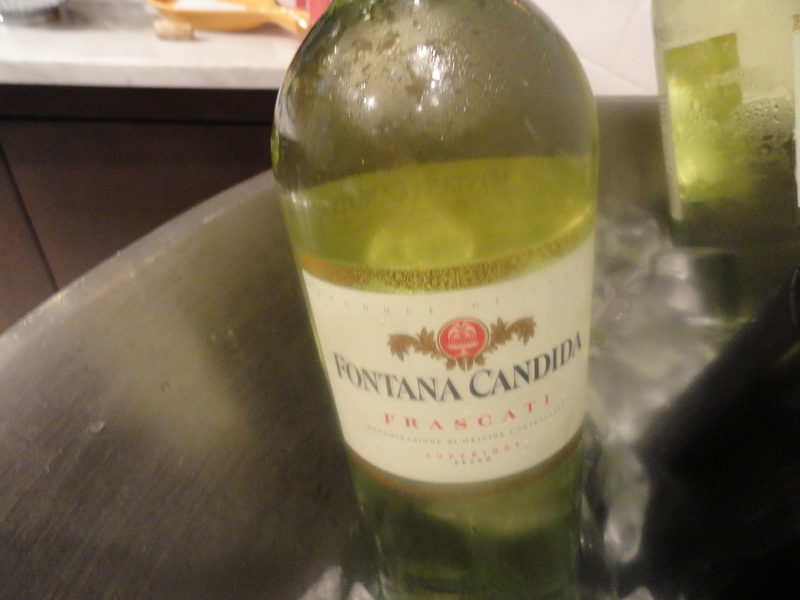 Frascati Superiore Secco 2009 DOC Lazio Fontana Candida Made from 60% Malvasia Bianca di Candia, 30% Trebbiano and 10% Malvasia del Lazio. The grapes come from hillside vineyards in the DOC zone located in the province of Lazio, in the communes of Frascati, Monteporzio Cantone, Grottaferrata, Montecompatri and Rome. The grapes are harvested between September and October and immediately transported to the cellar where they are gently pressed. Vinification takes place in temperature controlled stainless steel tanks. The wine is fermented and aged in stainless steel and then bottled under nitrogen to protect its freshness and fruit. The wine has aromas and flavors of white peaches and apples. 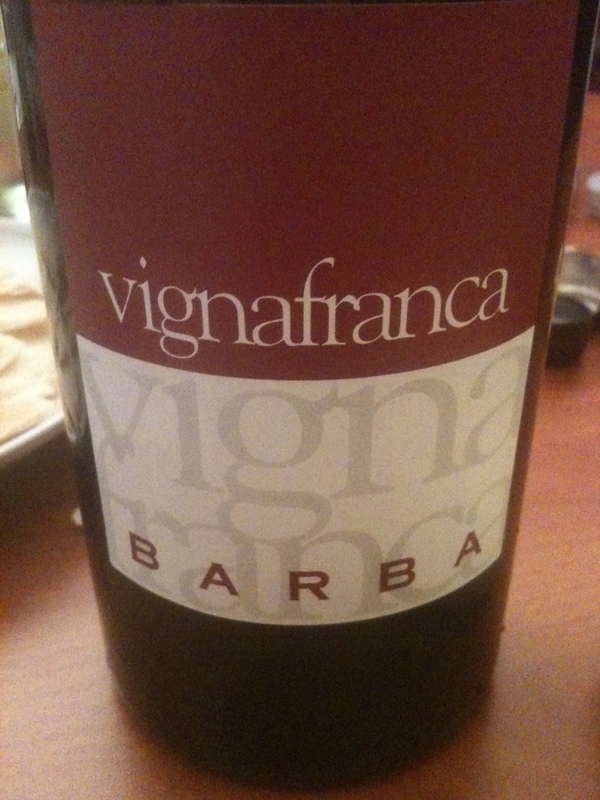 It has good acidity and minerality with a long finish and a nice aftertaste. $10. 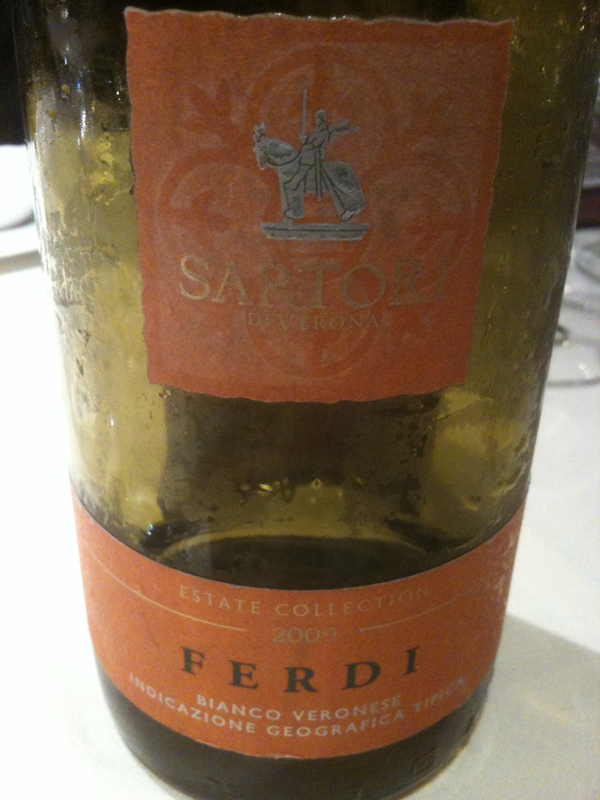 Bianco Veronese “Ferdi” 2009 IGT Sartori di Verona (Veneto) made from 100% Gaganega. There is a careful selection of handpicked grapes from different vineyards that are partially dried in small boxes for 30- 40 days (appassimento) in order to reduce water and concentrate sugar content and color. 3 grams of sugar per liter in the wine is balanced by the acidity. There is a light cold soaking. The pressing of the grapes is followed by short skin maceration at a low temperature. Cuppa Ramato 2009Venezia Giulia Pinot Grigio IGT 2009 Attems. 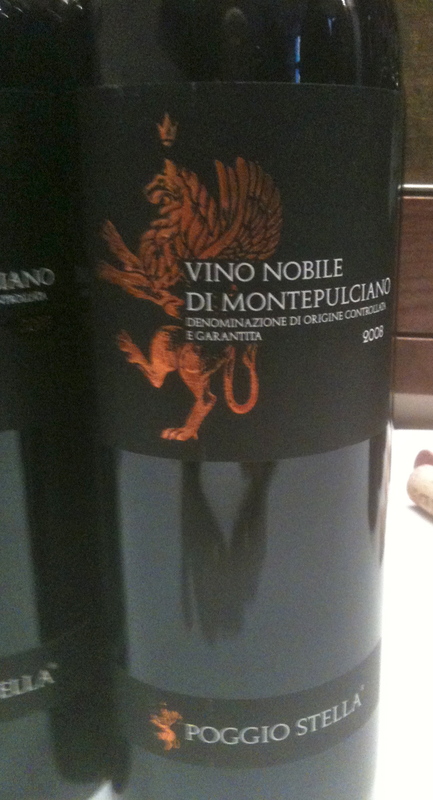 This wine goes back to the way Pinot Grigio was made during the time of the Republic of Venice. Ramato, meaning copper, was the term used to describe the color of the wine. Some clones of Pinot Grigio can also be copper in color. 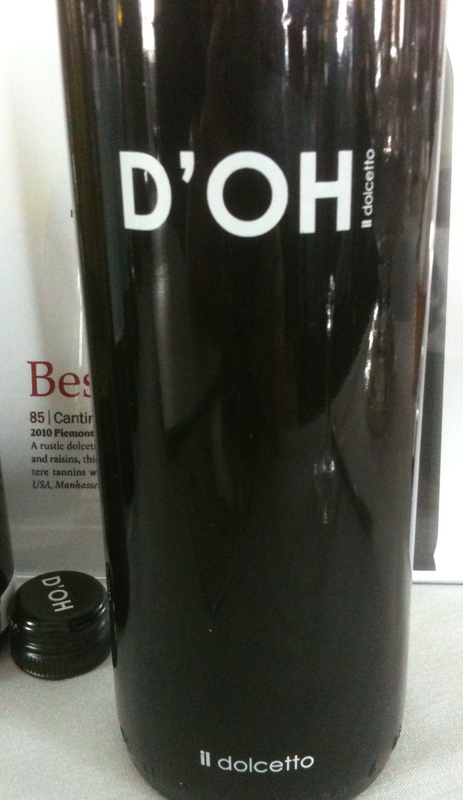 The traditional vinification process led to the use of this name. The must remains in contact with the skins for 36 hours and this gives the wine a very distinctive coppery hue. The term “orange wine” is used to describe white wine where the juice has had skin contact. 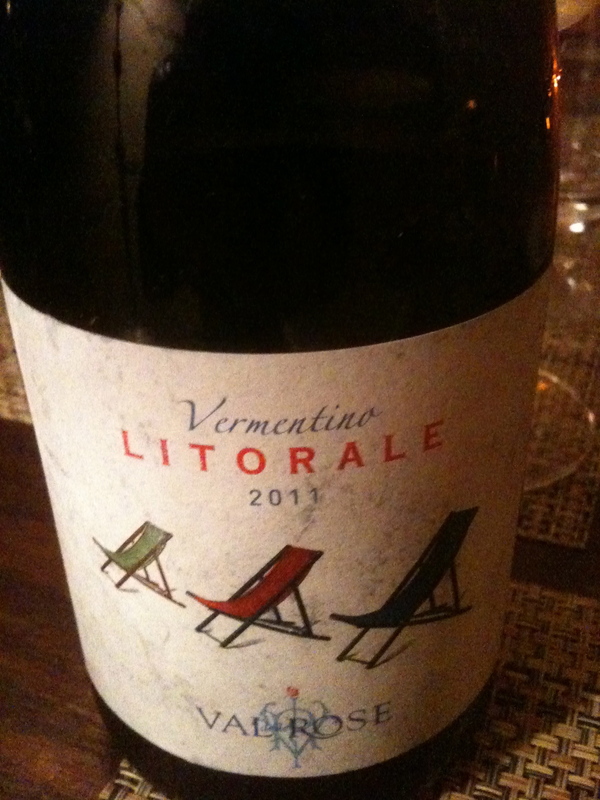 Vermentino Maremma Toscana IGT 2011 Cecchi 85% Vermentino and 15% other approved grapes. The vines are at 150 meters and the training system is guyot. There are 5,500 grapes per hectare. Harvesting takes place the beginning of September. After the grapes are picked they are left for 12 hours at a temperature of 8°C in contact with the skins in order to keep the primary aromas. Falanghina Beneventana IGT 100% Falanghina Donna Chiara. (Campania) The soil is chalky clay, there are 2,500 vines per hectare, the training system is Guyot and the harvest takes place the first week of October. Fermentation in stainless steel at controlled temperature for 40 days. The wine does not undergo malolactic fermentation and does not see any wood. “Calabria Revisited” was the theme of a dinner organized by the American Institute of Wine and Food at Alloro Restaurant in Manhattan to benefit their children’s outreach program known as the Days of Taste. Chef Salvatore Corea, who was born in Calabria, was our host and presented a menu of regional dishes. His wife Gina made everyone feel at home in this family run restaurant. 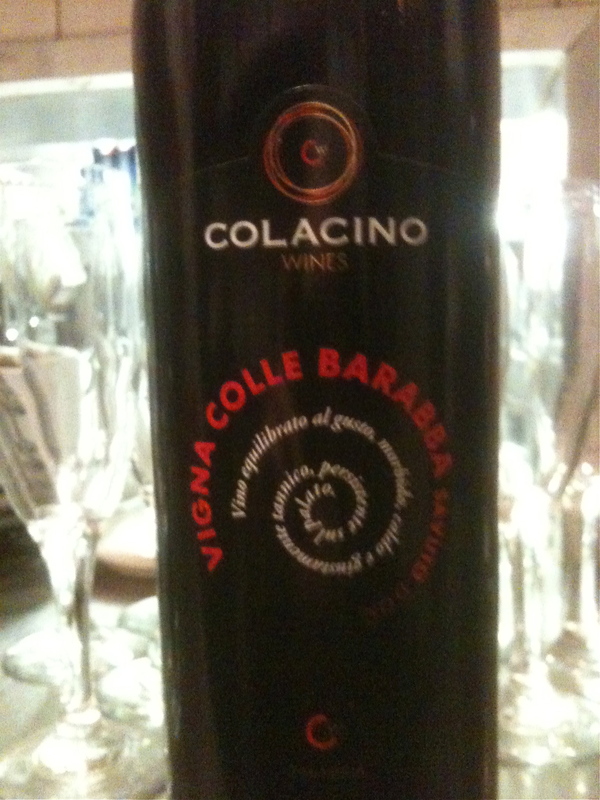 I was asked to speak about the wines of Calabria and the three wines we were having with dinner. Calabria is the most rural and least industrialized regions of Italy. 90% of the wine production is red. Except for Ciró, the wines of Calabria are not very well known in this country. Calabria has a history of viniculture going back to the ancient Greeks and Romans, in fact the Greeks called Southern Italy Enotria, the land of wine, but today Calabria seems to have fallen behind the rest of Italy. 90% of the the wine production is red. It is the most rural and least industrialized regions of Italy. The Slow Wine Guide, published by the Slow Food organization, lists only two wineries from Calabria in its English version of the guide. 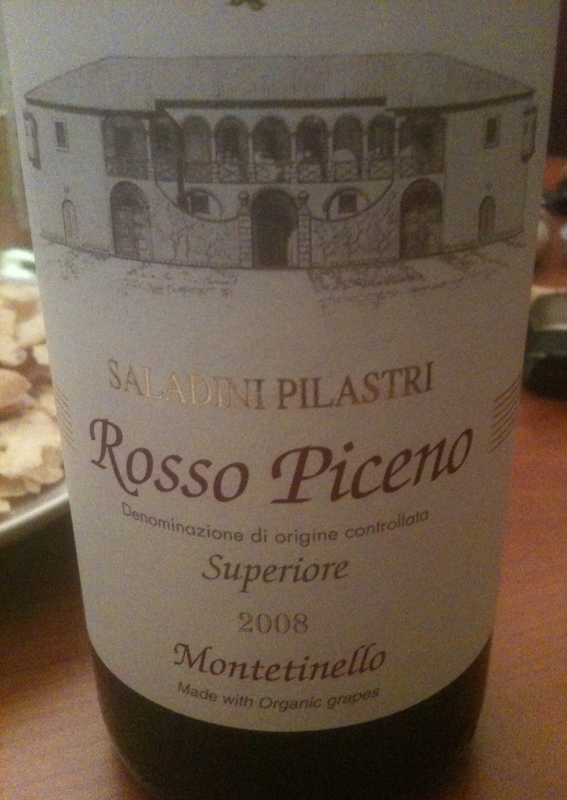 The Gambero Rosso guide lists many more wineries, including the ones that we had with dinner. 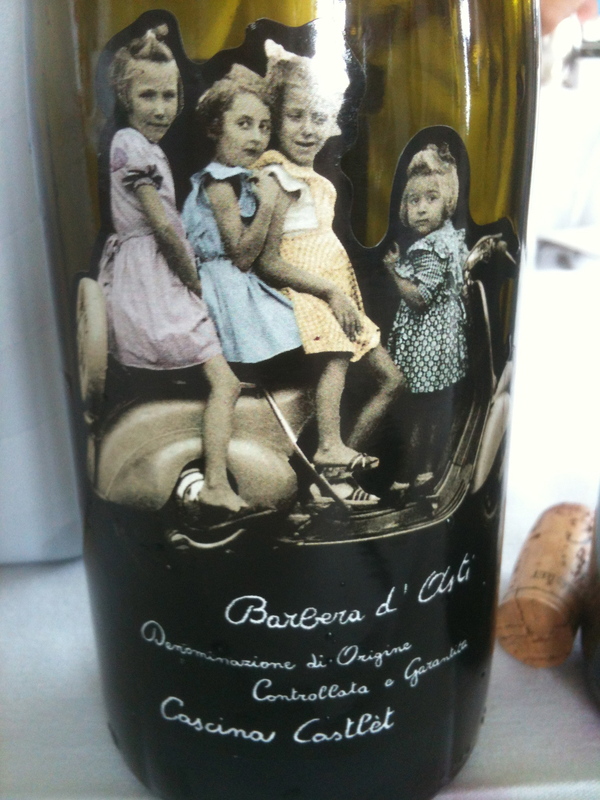 In the 2009 edition, they awarded three glasses, their highest award to a few wines, one being a Ciró and a wine from Calabria was named sweet wine of the year. Things may be improving, but they still have a long way to go. 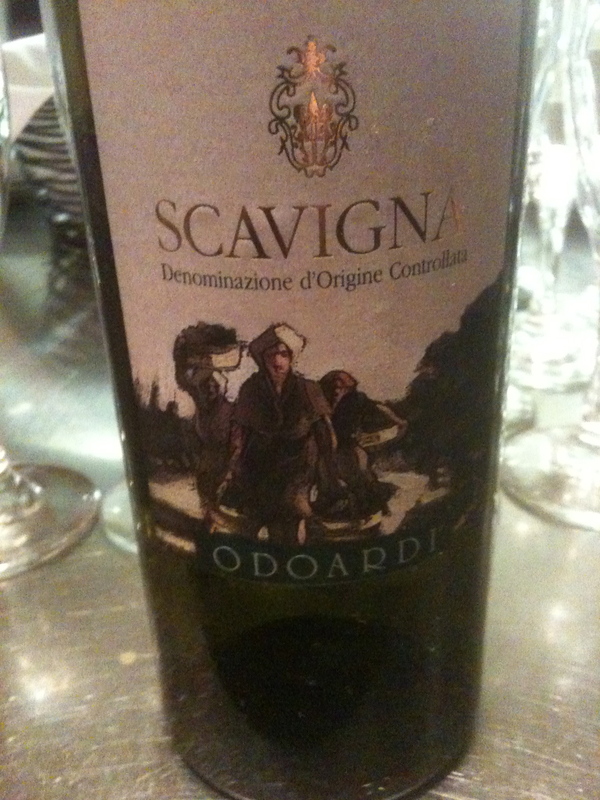 Scavigna Bianco DOC 2010 made from Greco Bianco, Chardonnay, Malvasia, Trebbiano, Pinot Bianco and Riesling. Azienda Agricola Odoardi the winery is at 600 meters. The soil is calcareous clay and the training system is Guyot. The harvest takes place in late August and the wine is fermented in stainless steel tanks. The wine had flavors and aromas of white peaches with notes of herbs and grass. They are one of the few producers that make this wine. Owners are Giorgio and Giovanbattista Odoardi. 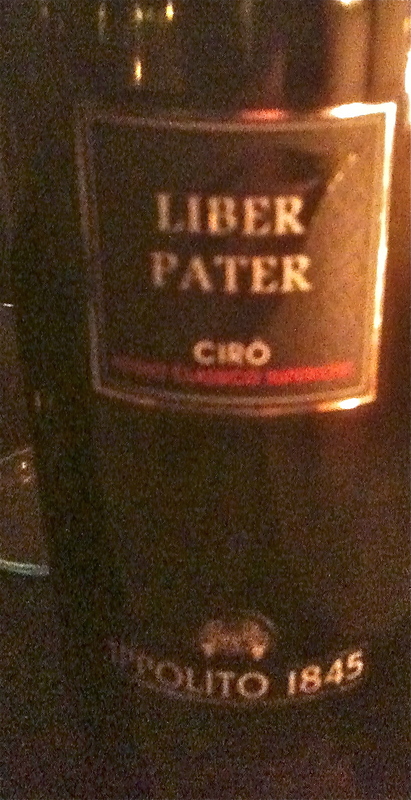 Ciró Rosso Classic Superiore “Liber Pater” DOC 2009 it is made from 100% Gaglioppo grapes. The wine is fermented in stainless steel. Ippolito 1845. This is a rustic wine with deep red and black fruit aromas and flavors with a hint of leather. It has a long finish and a distinctive aftertaste. I liked the wine and it was a great combination with the Candele di Gragnano con ragù n’juduia, pecorino crotonese, scorzette d’agrumi di candite, long pasta tubes in a sauce flavored with a spicy soft sausage and candied lemon zest. Gaglioppo is a grape that was probably brought to Southern Italy by the ancient Greeks, or so the producers say. However this has become a matter of debate. Ciró is the best known of the Calabrian wine regions and makes a very distinctive wine. However this is going to change as the production code now allows international grape varieties to be added to the Gaglioppo. The Slow Wine Guide is against this “…it finds this decision perplexing not only because it goes against tendencies in the rest of the South but because it is a hard blow to a distinctive DOC that has contributed significantly to Italy’s wine history.” I could not agree more! Savuto Rosso Blend DOC “Vigna Colle Barabba” DOC made from the Arvino, Greco Nero, Magliocco, Canino and Nerello Capuccio grapes. Mauro Colacino. They use spurred cordon-sapling training for the vines. The wine is fermented in stainless steel This is a softer, more elegant wine than the Ciró with subtle red fruit aromas and flavors and a hint of cherry. This wine went very well with the Filetto di maiale con salsa di miele e peperoncino, verze stufate, crema fritta e pancetta crocante,roasted pork lion, with honey & spice red pepper sauce, braised cabbage, fried cream and crisp pancetta. N’ Tice Liquor, Calabria, a digestivo that is made from vodka, grappa and citrus and was the perfect end to the dinner.